Originally established in 1987, we have a wine shop in Monmouth. Our aim has always been to sidestep the mass market monsters and offer better quality at reasonable prices - individual tastes and flavours that positively excite the palate rather than pandering to absolutely everybody and offending no-one. We only stock wines we like, that have real character and are fairly priced. 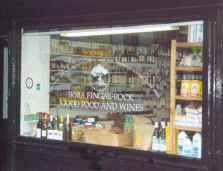 When we first opened in early 1987 we thought to have a food shop, but over the years the wine side has developed to such an extent that in January 2003 we stopped selling cheese to concentrate almost entirely on wine. Since then, happily, sales have leapt ahead. Among our customers are various corporate clients, such as the largest merchant bank in the City of London, a college at Oxford University and restaurants listed in the Good Food Guide. We have been included in the Top 100 section of UK wine merchants in the 2003 edition of the Which? Wine Guide, and also, as you can see from the lovely gold plaque at the top of this page, the International Wine Challenge selected us for the award of REGIONAL WINE MERCHANT OF THE YEAR 2003-4 for Wales. While our opening hours appear rather restricted, we are actually licensed to sell alcohol between the hours of 8 in the morning and 11 at night, Monday to Saturday, and on Sundays from 10 in the morning to 10.30 at night. I emphasise that you are welcome to ring (either the doorbell, or by telephone) and if I am in (I live on the premises) I will be very happy to attend to you during the hours licensed. There is also a 24-hour answering machine so that you can leave messages. Feel free to visit our Facebook page- http://www.facebook.com/FingalRock/ - we aim to make regular updates regarding recent additions to the shop's stock and also comment on mentions made to us by other websites and magazines.